This post is sponsored by Sprouts. As always, all opinions are my own. Thanks for supporting the brands that keep Lively Table running! What is a football party without desert? As the girl who’s only there for the food (ok, and I guess friends too), a dessert-less football party is well, just a football party. Do your guests a favor and whip them up a dessert dip they’ll love snacking on while watching the game! Even better, whip them up a healthier dessert dip that tastes decadent, but is actually made with real food ingredients all found at Sprouts! A dessert dip that tastes like peanut butter cups, perhaps? Ummmm, yes please! This healthy peanut butter cup cheesecake dip is the ultimate football party dessert. It’s smooth, creamy, and full of chocolatey, peanut butter-y bliss. It’s so easy to make ahead, too, so you get it done early, set it aside, and then set out for your guests to enjoy when it’s game time. Just blend up the ingredients in your food processor, top with mini peanut butter cups (you can find them in the bulk section at Sprouts), and you’ve got a fluffy, flavorful treat everyone will love. 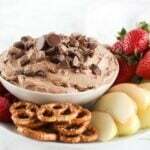 I like serving this creamy, dreamy healthy peanut butter cup cheesecake dip with an assortment of fruit, along with both salty and sweet dippers like pretzels and vanilla wafers. Your friends can get a serving of fruit with their dessert, along with protein, fiber and healthy fat from the dip! But they won’t even know it’s healthy, they’ll just know it tastes amazing. This dip is also a tasty way to get your kiddos to enjoy more fruit. You can serve a bit with apple slices or strawberries as an after school snack or after dinner treat. It would also make such a fun Valentine’s Day dessert. The possibilities are endless! What are you usually in charge of when it comes to football parties? If it’s dessert, you’ve got to try this healthy peanut butter cup cheesecake dip! For serving: fruit, pretzels, vanilla wafers, etc. Combine all ingredients except for peanut butter cups in a food processor. Blend until smooth and fluffy. Gently stir in most of the peanut butter cups, reserving a few for garnish. Spoon dip into a serving dish and sprinkle with remaining peanut butter cups. Serve with fresh fruit, pretzels, vanilla wafers, or cookies/crackers of choice. If you are not serving immediately, place dip in the refrigerator until ready to serve.